A fire-team is small infantry team of four that operates at the tactical level. It is generally considered as the second smallest organisation in armed forces that employ the bounding overwatch tactic, in which the smallest organisation capable of independent operation being crews of machine guns, anti-tank launchers, mortars, or specialist teams such as a sniper team (consisting of a spotter and shooter). The fire-team utilises the doctrine of overwatch, whereby a subunit or element provides cover for another subunit or element from its protected position with unobstructed lines of sight, and thus, fire on a target. A subunit is a subordinate unit of a company or battalion at the operational level, varying in strength from 80 to 250 and 300 to 800 troops respectively, depending on the particular military. A company in a battalion will generally consist a minimum of three platoons of around 26 to 40 troops, typically classified by codenames – Alpha, Bravo and so on. Platoons are either divided into squads or sections of around eight to twelve troops, again dependent on the military structure. In professional militaries that emphasize a strong tactical leadership, the squad is preferred over the section as the small subunit. On the other hand, armed forces that employ mass conscription or large infantry formations typically use the section as the second smallest organisation. The squad is then split into two to three fire-teams. – A Rifleman: Armed with a service rifle, which may or may not be fitted with an under-barrel grenade launcher. His primary responsibility is to eliminate individual (point) targets with timely, well-aimed fire. When equipped with a grenade launcher, his responsibility extends to neutralise and eliminate individual or mass (area) targets behind cover (trenches, walls, vehicles etc). The Rifleman acts as the point-man and scout of the fire-team by default, informing the team of enemy contact, movement or signs of booby traps. Point position is rotated with other team members at regular intervals to preserve situational awareness. – A Gunner: Armed with a fully-automatic weapon, typically a Squad Automatic Weapon (SAW) or Light Machine Gun (LMG). His primary responsibility is to suppress and neutralise area targets with timely, fully-automatic fire. Suppressive or covering fire may be provided in sustained, rapid, or cyclic (continuous) rates-of-fire. As the Gunner, he acts as the fire-team’s base of fire to provide the support necessary for the team’s element to move unhindered in the field. Typical suppressive fire commences with a 6- to 8-round burst to force the enemy into cover, then sustained at regular intervals with three or four well-aimed rounds at the enemy position. – An Assistant Gunner: Armed with a service rifle. His primary responsibility is to supply the Gunner’s weapon with a steady stream of ammunition and to perform timely barrel swaps when said weapon’s barrel is overheating. If the Gunner uses a Squad Automatic Weapon, the Assistant Gunner also carries additional ammunition for the rest of the fire-team as the SAW shares essentially the same ammunition as the fire-team’s rifles, albeit usually with tracers and heavier projectiles. As the Assistant Gunner, he acts as the gunner’s lookout and the fire-team’s rear guard / security (again, may be rotated at regular intervals). – A Team Leader: Armed with a service rifle, typically fitted with a grenade launcher, making him the fire-team’s grenadier by default. His primary responsibility is to initiate work towards the unit’s objectives, monitor his team’s progress, intervene where necessary, and report results and changes in the field to Commanders; the Team Leader also maintains team spirit, morale and welfare in the fire-team. As the Grenadier, he acts as the fire-team’s light assault-man to neutralise, eliminate targets behind cover and destroying unarmoured vehicles. Orders from Commanders are given through him, and requests from Members are made through him. The Team Leader may sometimes take point, but will usually stay close to the Gunner to direct his fire on targets more efficiently. In the field, a fire-team serves as the advance force and vanguard for the unit’s main concentration of effort. The fire-team is designed to be split into two maneuver elements of two men each, with each element covering one another’s movement. A typical fire-team formation is the Staggered Column, wherein the four soldiers are formed in a front-to-back zig-zag column. The Rifleman moves several metres in front of the column to act as the fire-team’s eyes and ears. The Team Leader usually takes second position, directing the team’s movement and elements’ actions from behind and to the side of the point-man. The Gunner and Assistant Gunner would then make up the trail element, providing support and rear security for the lead element. The Staggered Column enables the fire-team to move more efficiently together (especially in tight environments like jungles), being more streamlined in the direction of movement. It also makes it easier to react to contact from the flanks. Upon contact, the lead element provides covering fire while the trail element rushes to the nearest available cover or concealed position. The Gunner and Assistant Gunner then establish a base-of-fire for the Rifleman and Team Leader to move to a better position, i.e. flank. Another fire-team formation is the Echelon, in which the four soldiers are positioned in an asymmetric arrowhead shape. In this formation, the Team Leader takes point at the leading tip of the formation, and is supported by the Gunner several metres behind and to the side. The Echelon is held by the Assistant Gunner and Rifleman on either end of the arrowhead, diagonally extending the sides of the formation. 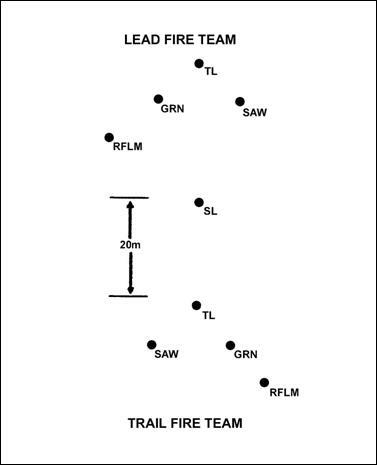 This formation is employed when the fire-team is moving in an open area, as it enables every Member of the team to maintain security and provide immediate fire in every direction. The Echelon can be spread out or shrunk according to the amount of available cover and the type of terrain that the fire-team is operating in. The arrowhead shape of the Echelon (alternatively a wedge or “inverted V” formation in a squad) allows the fire-team to overwhelm an enemy line more effectively than other formations due to a higher concentration of fire along the length and depth of the formation. A fire-team in an Echelon formation can also instantaneously react to contact on the flanks and the rear, in which the trailing element can fix the enemy in place as the “tip” of the arrowhead closes in. A Squad Wedge is formed when two or more Fire-team Echelons combine at the short trailing end of the formations, thereby increasing the situational awareness and combat effectiveness of the small subunit. A well-trained, close-knit fire-team is capable of covering an open area of 90000 square metres when appropriately spread out. At night, this effectiveness is usually diminished but can be preserved with the aid of night vision devices and secure communication equipment.